In this section, the same upper-case letter denotes a vertex of a triangle and the measure of the corresponding angle; the same lover case letter denotes an edge of the triangle and its length. radians. This induces relationships between trigonometric functions that are summarized in the following table, where the angle is denoted by \theta instead of A. For an angle of an integer number of degrees, the sine and the cosine may be expressed in terms of square roots and the cube root of a non-real complex number. Galois theory allows prooving that, if the angle is not a multiple of 3°, non-real cube roots are unavoidable. Trigonometric functions are analytic functions. 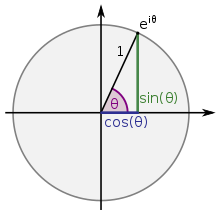 Using only geometry and properties of limits, it can be shown that the derivative of sine is cosine and the derivative of cosine is the negative of sine. One can then use the theory of Taylor series to show that the following identities hold for all real numbers x. Here, and generally in calculus, all angles are measured in radians. 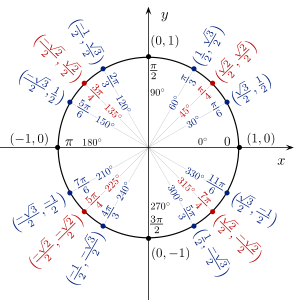 When the series for the tangent and secant functions are expressed in a form in which the denominators are the corresponding factorials, the numerators, called the "tangent numbers" and "secant numbers" respectively, have a combinatorial interpretation: they enumerate alternating permutations of finite sets, of odd cardinality for the tangent series and even cardinality for the secant series. 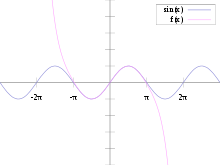 The series itself can be found by a power series solution of the aforementioned differential equation. 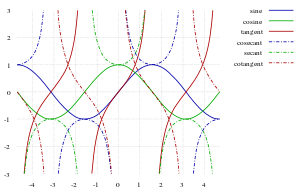 In the following graphs the domain is the complex plane pictured with domain coloring, and the range values are indicated at each point by color. Brightness indicates the size (absolute value) of the range value, with black being zero. Hue varies with argument, or angle, measured from the positive real axis. This may also be used for extending sine and cosine to the complex numbers. 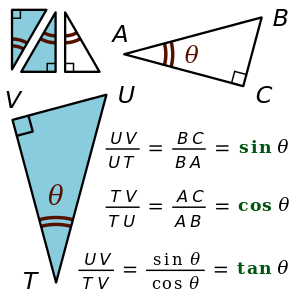 Other functional equations are also possible for defining trigonometric functions. ^ Needham, Tristan (1998). Visual Complex Analysis. ISBN 978-0-19-853446-4.